Pro's Tip A narrow driving area. Use long iron or fairway wood off the tee. Pro's Tip Hit away with your driver - if you catch a good one, you might be able to get home in two. 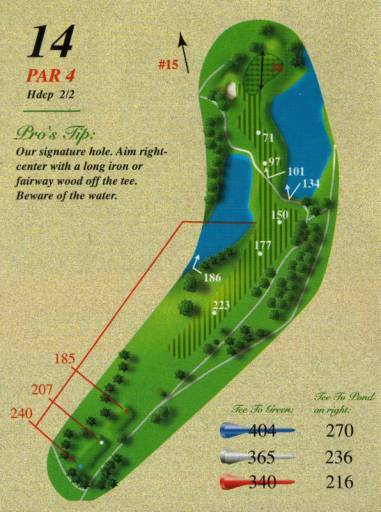 Beware of the water in front of the green. 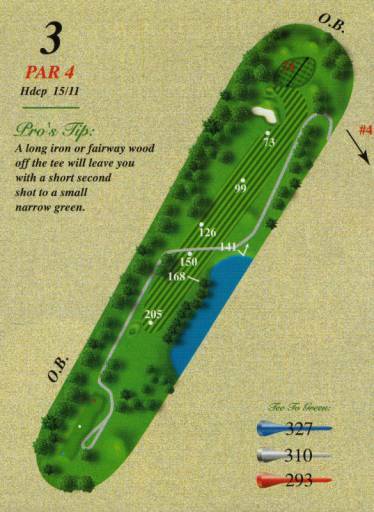 Pro's Tip A long iron or fairway wood off the tee will leave you with a short second shot to a small narrow green. 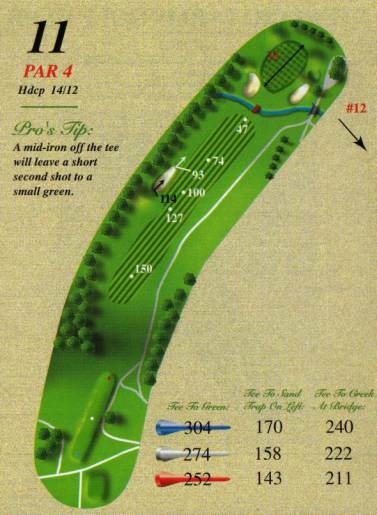 Pro's Tip A long or mid-iron to the middle of the fairway will leave you in perfect position. 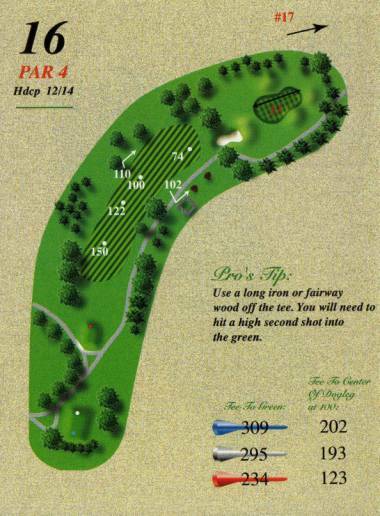 Pro's Tip A long par 3 with a narrow sloping green that plays longer then it looks. Pro's Tip Use a driver off the tee. 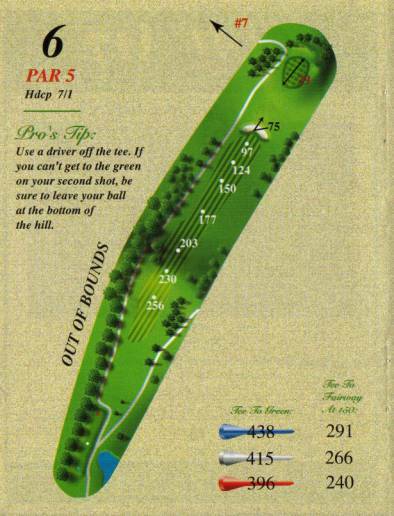 If you can get to the green on your second shot, be sure to leave your ball at the bottom of the hill. 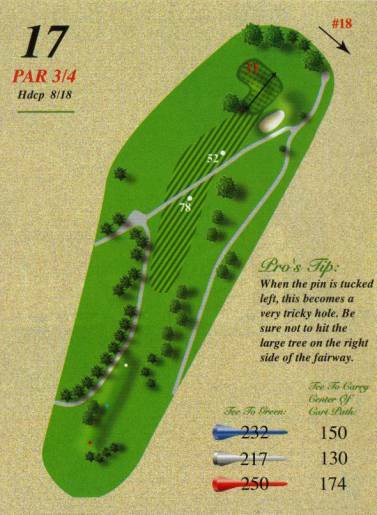 Pro's Tip Use a mid iron off the tee, or if you feel daring, use a driver and aim over the left side of the trees on the right. 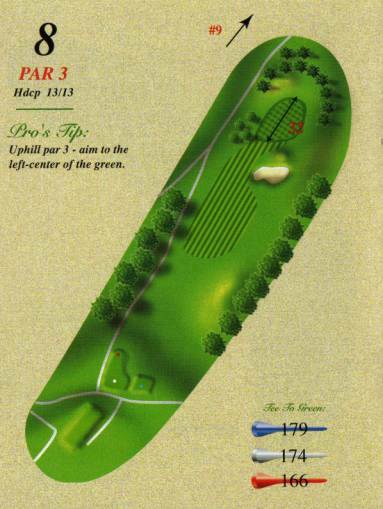 Pro's Tip Uphill par 3 - aim ot the left-center of the green. 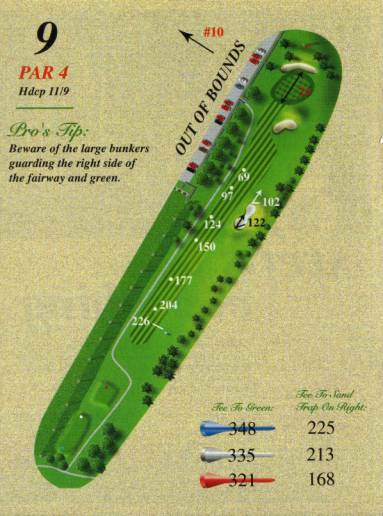 Pro's Tip Beware of the large bunkers guarding the right side of the fairway and green. Pro's Tip With your driver aim to the left-center of the fairway. You don't want to be long with your second shot. 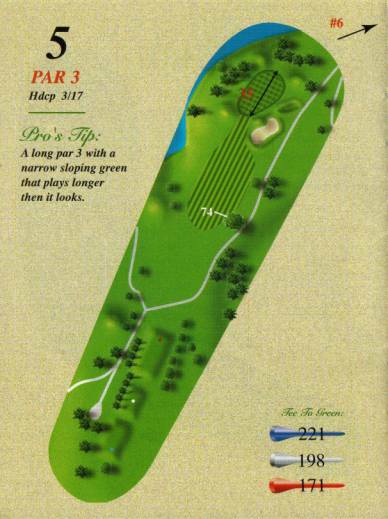 Pro's Tip A mid-iron off the tee will leave a short second shot to a small green. 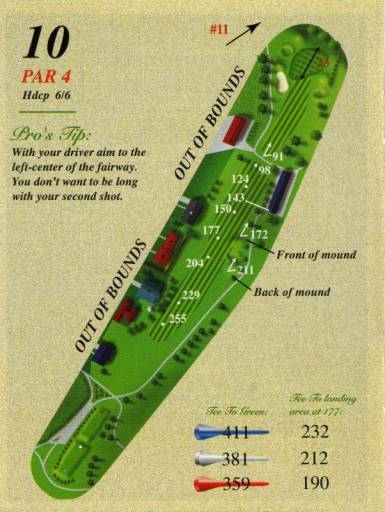 Pro's Tip Be sure to aim your driver to the left-center of the fairway. Pro's Tip Aim your driver down the center of the fairway. 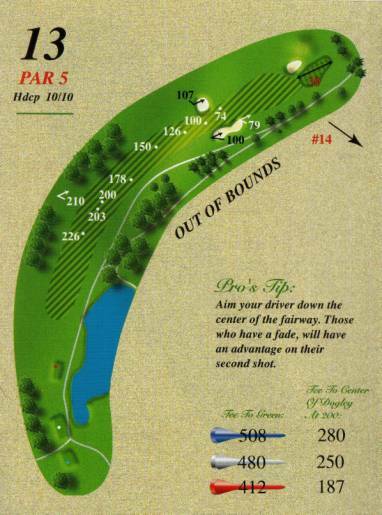 Those who have a fade, will have an advantage on their second shot. 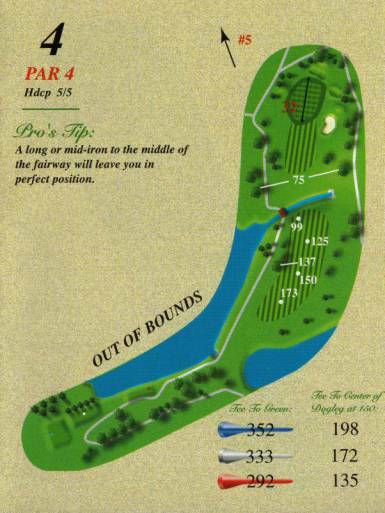 Pro's Tip Our signature hole. Aim right-center with a long iron or fairway wood off the tee. Beware of the water. 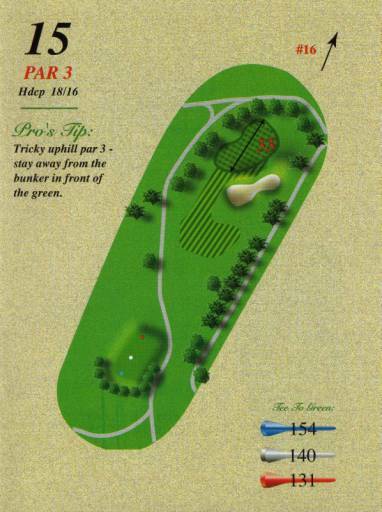 Pro's Tip Tricky uphill par 3 - stay away from the bunker in front of the green. Pro's Tip Use a long iron or fairway wood off the ice. 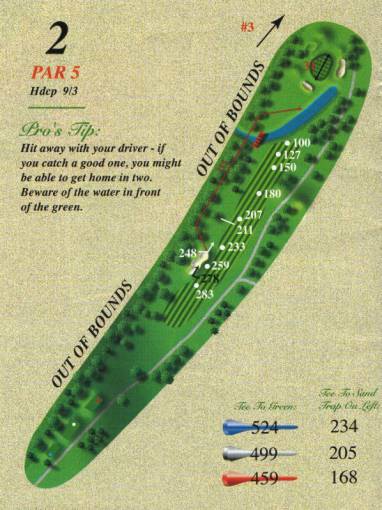 You will need to hit a high second shot into the green. 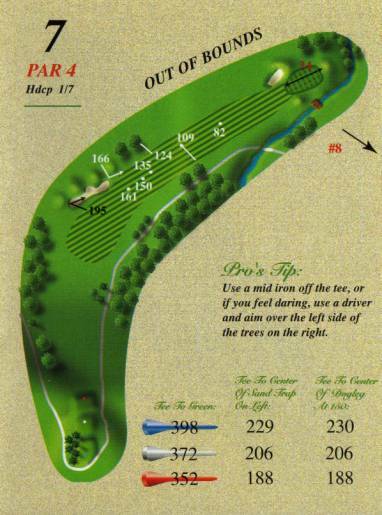 Pro's Tip When the pin is tucked left, this becomes a very tricky hole. 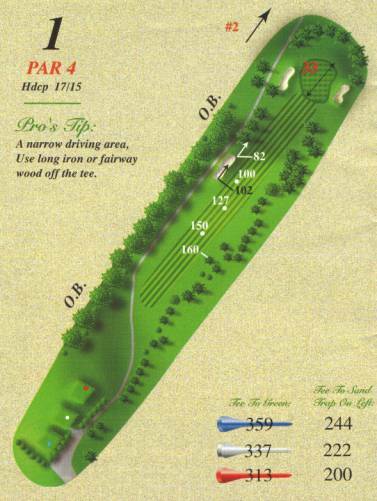 Be sure not to hit the large tree on the right side of the fairway. Pro's Tip Driver off the tee - long hitters may be able to reach in two. Very nice finishing hole. 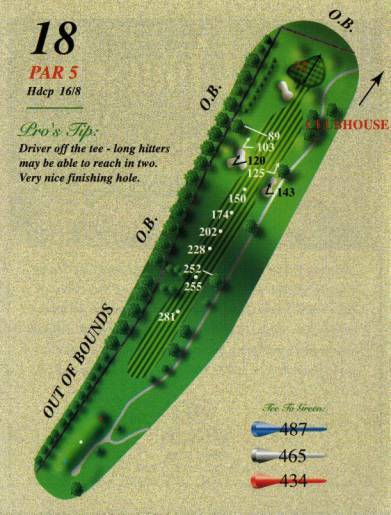 the tee - long hitters may be able to reach in two. Very nice finishing hole.